Direct Attach Cable, or DAC for short, is a kind of optical transceiver assembly widely applied in storage area network, data center, and high-performance computing connectivity etc. The DAC cables are used to connect one mobility access switch with another when forming a stack. 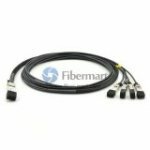 Fiber-Mart supplies various kinds of high speed interconnect DAC cable assemblies including 10G SFP+ Cables, 40G QSFP+ Cables, and 120G CXP Cables. All of our direct attach cables can meet the ever growing need to cost-effectively deliver more bandwidth, and can be customized to meet different requirements.